One of the costliest parts of growing your own food is buying garden seeds each spring. These days, a single packet of seeds can cost $5.99 or more. And a whole lot of folks are becoming concerned (and rightly so) with the presence of GMOs in our seed. Fortunately, saving your own seeds from the garden is very easy and will save you money, too. But a lot of people are confused about just what seeds to plant in order to save seeds at all. Corn seed is dried on the stalk until freezing weather threatens. 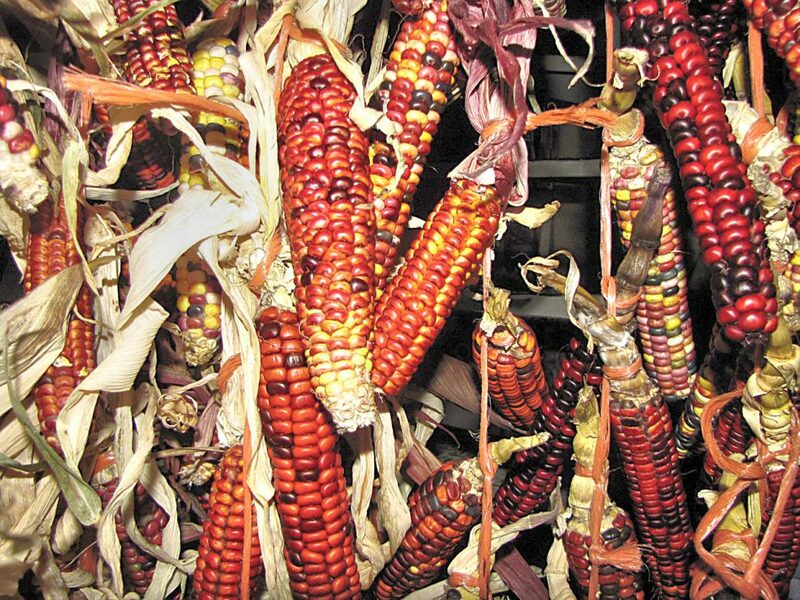 Then it’s best brought inside, shucked and hung to dry as this Painted Mountain corn is doing. Hybrids are a cross between two varieties of the same species. For instance, one tomato variety with another tomato variety or one sweet corn variety with another. This has been done for thousands of years. Sometimes this occurs by accident when someone plants two varieties of the same species of squash in the same garden. 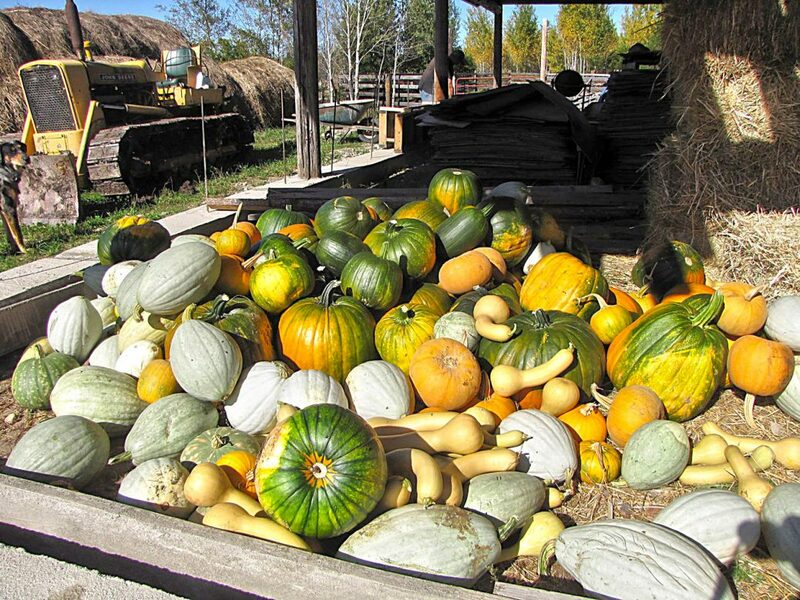 Native Americans often had this happen as they grew several types of squash nearby. The results can be surprising, colorful, and very tasty. Modern-day hybrids are often set up by plant breeders trying to introduce such characteristics as ease of shipping, ripening time, and disease resistance. Unfortunately, with most modern hybrids, the importance of these characteristics override the importance of taste. It’s commonly believed that hybrids are sterile and won’t grow if you save the seed and plant it next year. This is wrong. While there are some commercial crops such as field corn, which has been altered to contain a “terminator” gene so farmers can’t save their own seed, this is not yet a concern with home gardeners. In fact, many modern open-pollinated varieties have been bred back from a hybrid until they have become stabilized. I say “stabilized” because when you’ve saved the seeds from a hybrid, the results may not be what you’re picturing. The new plants may or may not resemble the parent from which you’ve saved seed. It takes years of careful selection and breeding to get that hybrid variety to become stabilized so it will consistently produce “cookie cutter” plants and fruits. The term open-pollinated means that a variety is stabilized and will produce a crop exactly like the “mother” plant you saved seeds from. This open-pollinated variety may be only a few years old or may be an ancient variety. But it will always produce the same crop unless crossed with another of the same species. Heirloom seeds are old-time varieties that may be only a few generations old or as ancient as the hills. We have a strain of beans that were carbon-dated back 1,500 years. There is a debate as to just what constitutes “heirloom”; some say 30 years at minimum, where others say at least 50 years. Regardless, heirloom varieties are tried and true and have been around for years. Long before spring planting, shop through some catalogs and websites offering open-pollinated vegetables. When making your decision, take into consideration your growing climate and soil. If you live in a moderate climate, your choices are broad. But if you live in a more challenging climate, your choices narrow quite a bit. The easiest crops from which to save seeds are annual crops which do not require over-wintering. These include sweet corn, dry corn, pumpkins, squash, tomatoes, okra, peppers, and watermelon. Squash and pumpkins are best brought in before heavy frosts to a sheltered area to ripen further for a couple of months before harvesting the seed. Simply pick out and rinse pumpkin seeds, then lay them out on a cookie sheet to dry for a week or more. Remember that some crops, such as corn, are pollinated by the wind. On a homestead, planting different varieties of corn at least 200 feet apart usually keeps two varieties from crossing. For additional protection against unwanted cross-pollination, choose an early variety and a later variety with at least two weeks of time between their maturity dates. When planting to sell seeds, you often have to isolate your corn varieties by a mile or else hand-pollinate (which is too labor-intensive for homestead consideration). We plant an early sweet corn variety in our garden next to a very late maturing popcorn. When the sweet corn tassels out and sends its pollen about on the wind, the popcorn hasn’t even thought about sprouting tassels. Tomatoes and beans are nearly always self-pollinating, meaning that if you separate varieties by a few feet, they will nearly always breed true. Watermelons, muskmelons, cucumbers, pumpkins, and squash are chiefly pollinated by insects, usually by bees, flies, and other garden insects, so varieties will easily cross. We only plant one variety of muskmelon, one variety of watermelon, one variety of cucumber, and one of each species of squash and pumpkin. (Pumpkins are squash but squash are not always “pumpkins.”) All are Cucurbitas. Most pumpkins and some squash (often summer squash) are Cucurbita pepo. So if you plant a summer squash near a C. pepo pumpkin, they will probably cross. That’s why we only plant one variety of C. pepo in our main garden. We don’t want crossing. It seems confusing, but when shopping for varieties, use a catalog that lists the species of squash and choose only one of each species and you’ll do fine. To save your own seeds, you must wait until each variety is totally ripe. Okra, beans, and peas should have seed dry in the pods when harvested. We’ve found that squash and pumpkin seeds germinate better when the seeds have been left in the mature fruit and have been standing at a room temperature for a couple of months. Sweet and “hard” corn for cornmeal should be fully dried on the cob, hanging on the plant, if possible. 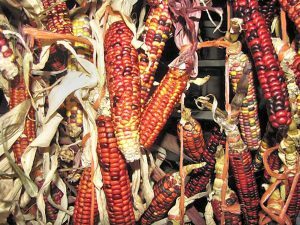 If freezes are predicted and the corn is still not completely hard, harvest the corn, pull back the shucks, and hang in a warmer, protected area until fully dry and hard. Sweet corn kernels will shrivel up; dent corn will partly shrivel, with a dent on the top of each kernel; and popcorn and other flint corns will have hard, shiny, rounded kernels. Once the kernels have dried thoroughly, shell them by hand into a pail or bowl. To save the seeds from tomatoes, simply choose one or two of the very best specimens in your garden when fully ripe. Bring them in and cut them in half (if small) or quarters (if larger). With your thumbnail, scrape the seeds out into a bowl, from each seed cell in each piece of tomato. When done, fill the bowl up at least half full of warm water and set out on the counter for about three days to ferment. The fermenting not only gets rid of the gel, which is meant to inhibit germination while the tomato is ripe, but it also helps ensure that there will be no disease passed from fruit to seed. When there is a white scum on top of the bowl (it stinks), dump the whole works into a wire strainer over the sink and run warm water through it, using your fingers to work the seeds and yucky stuff. The yucky stuff will pass through the strainer, leaving the seeds. Let the seeds drain in the strainer, then carefully dump them upside down on a plastic ice cream pail lid or plastic plate. Of all the things I’ve tried, these seem to work the best.) Spread them out with your finger and place in a warm, protected area to air dry for about a week or so. 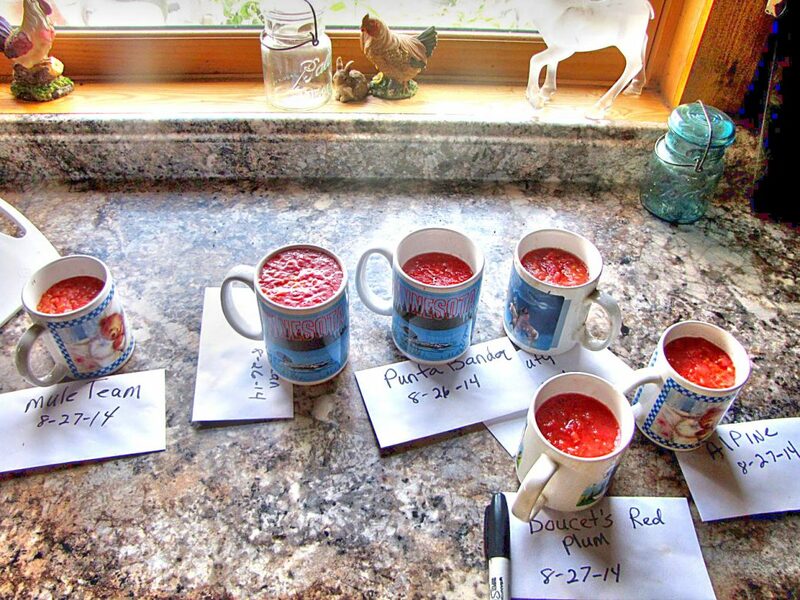 Set tomato seeds in bowls or cups filled with warm water and leave them on the counter for three days or so until they are fermented. It’s easy to harvest cucumber seeds from overripe, fat, yellow cukes. Just cut them in half lengthwise and scrape the seeds out into a bowl with your thumbnail. And, like the tomato seeds, place in a strainer and run warm water through them until the seeds are clean. You may also ferment these for two days and treat as above. Pepper seeds may just be removed from very ripe peppers and placed on a plastic plate to dry. Okra, beans, and peas should be harvested from dry pods. Beans and peas can have the entire plants harvested for speed of saving the seeds. We put ours in a plastic swimming pool and walk on them with clean moccasins. When the pods have mostly split and the seeds are out, we just carefully lift the spent vines off, leaving the seeds and chaff behind. Pouring the seeds and chaff into a large bowl, we winnow the seeds from one bowl to another in the wind. The breeze carries off dust, chaff, and bits of vine, leaving clean seeds behind. We usually lay the seeds out in shallow pans on the counter for a few days to ensure that the seeds are totally dry. 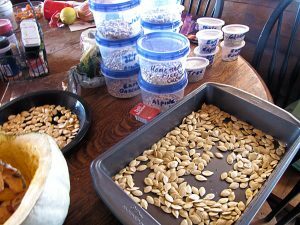 Squash, pumpkin, and melon seeds are simply picked out and rinsed, then spread out on a cookie sheet to dry for a week or more. Squash seeds often shed a paper-like membrane when dry. Winnow this off, after rubbing the seeds with your hands. When totally dry, the seeds are ready to store. You can store your harvested seeds in paper envelopes, but to protect them from moisture, insects, and rodents, it’s best to put these envelopes into an airtight container such as a wide-mouth canning jar, tin with a lid, or a plastic container. Be aware that rodents can and will chew through plastic to get at seeds, so choose rodent-proof containers! For long-term storage, you can keep these dry seeds in your freezer. Frozen, seeds will remain viable for generations. This is how seed banks preserve their rare collections of seeds.